The dispute settlement mechanism of the World Trade Organisation (WTO) is one of the most active international courts. How the WTO's adjudicators decide cases is the topic of a book chapter authored by Christiane Gerstetter, Senior Fellow at Ecologic Institute. 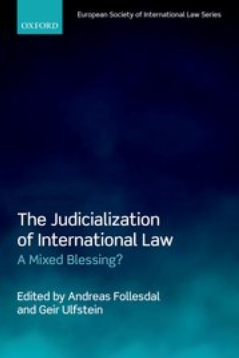 The book, entiteld "The Judicialization of International Law: A Mixed Blessing?" is edited by Andreas Follesdal and Geir Ulfstein and published by Oxford University Press. It deals with the influence of decisions by international courts on international law. Christiane Gerstetter focuses in her chapter on so called non-trade cases decided by the WTO dispute settlement bodies. These are cases where a country that is a WTO Member brings a complaint against another WTO Member over a measure that allegedly violates WTO law and is aimed at public policy goals such as environmental or health protection. Well-known examples are a dispute over an EU ban on hormoned-treated beef and a dispute over an US measure banning shrimp harvested in a manner harmful to sea turtles. In the book chapter, Christiane Gerstetter examines both how such non-trade cases have been decided in substance and what arguments the WTO dispute settlement bodies use to support their decisions, i.e. the judicial style they embrace. On substance, she concludes that the dispute settlement bodies have typically adopted decisions that neither consistently give countries a maximum of regulatory freedom nor such decisions that restrict countries regulatory freedom maximally to support international trade. On judicial style, she concludes that the adjudicators' style is predominantly formalist in nature, i.e. they use arguments that present their decisions as resulting inevitably from WTO law. They do not very openly acknowledge the decison-making space they have as result of the rather indeterminate character of WTO law. Christiane Gerstetter concludes that both elements combined help explain why the WTO dispute settlement system is by and large accepted by WTO Members as a legitimate forum for judicial decision-making. The publication is based on a presentation Christiane Gerstetter gave at the conference of the Europea Society of International Law (ESIL) in Oslo in 2015.